When the E36 was launched first launched, it was praised for the new-found handling balance afforded by BMWs famed Z-Axle. You will find this chassis arrangement of every BMW built since. The safety functions engineered into this arrangement afforded new levels of security and driver enjoyment, virtually eliminating the traditional difficult on-limit handling of powerful rear-drive cars. 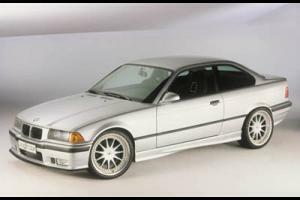 At the beginning, the most powerful engines in this chassis were the 190hp 325i. But given the newly found stability, engines up to 320hp found their way into the engine bay, with more than a little help from the BMW-M.
Of course it was only a matter of time before the renowned tuning house Hartge started to fettle this new car. Birds were first again to produce a fully tuned demonstrator, which featured in more than ten magazines, such was the interest in this car. Our favourite piece is here. And matters didn't stop there. Thoughout its lifecycle, as BMW continued to up the ante bringing out yet more powerful standard cars, Hartge and Birds developed tuning packages for them all. Through the 328i all the way to the M3 Evolution and beyond, culminating in the fabulous Hartge M3 with 3.5l 350hp high torque engine. Regrettably, there are very few conversions still available for this model, apart from the renowned Quaife ATB limited-slip differentials. To visit our databese for the E36, click here.